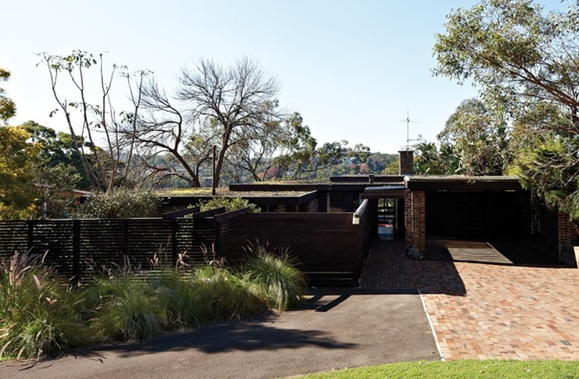 The Sydney School refers an architectural style established by a group of architects in Australia who reacted against international Modernism with their own regionalist style during the 1960s. 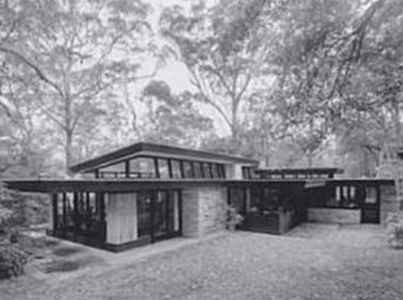 The Sydney School was concerned with site-specific regional architecture which would improve the quality of housing for average Australians. Their philosophies of design and place is said to have represented a solution to the fear and angst of the war years. Architects focused on creating new and exciting opportunities for living within, rather than against, their unique landscape. 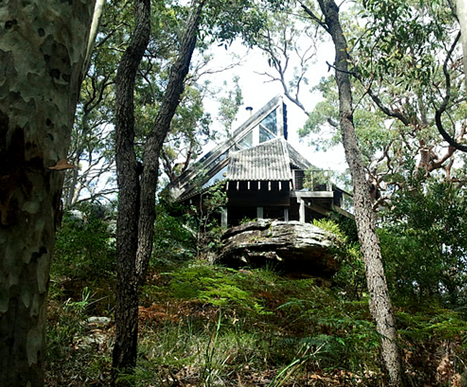 Sydney School houses were often built on sloping bush-land. The sites had a great influence on the architects, with the native landscape being fundamental. The houses typically followed the slope of the site through split level planning with roofs parallel to the slope, creating complex and interesting interior spaces. Natural materials were exploited, with dark tiles, clinker or painted bricks and stained timbers creating a feeling of warmth in the houses. 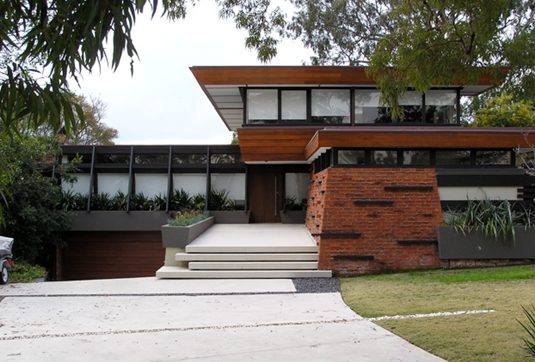 The organic approach is said to have been influenced by the work of America’s Frank Lloyd Wright, where materials were used in their unaltered state and blended with the natural colours and textures of the bush-land sites. As Goad explains the houses possessed a sense of ground, shelter, material, space proportion, order and technique. This approach is reflected in the work of: Bruce Rickard, Ian McKay, Neville Gruzman, Roberston & Hindmarsh, Bert Read, Alan Gilbert and Adrian Snodgrass. Goad explains how these houses were inspired by traditional Japanese architecture, which displayed a “truthful expression of materials and construction aligned with spatial fluidity and flexibility”. This approach is reflected in the works of Peter Muller, Neville Gruzman and Ian McKay. 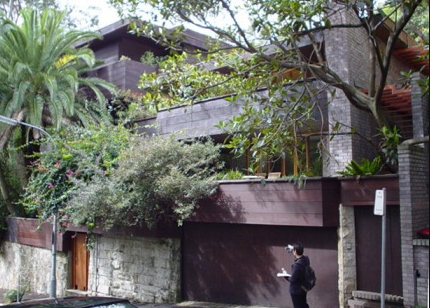 An number of these architects credit Adrian Snodgrass and Bert Read with their introduction to the philosophies of Frank Lloyd Wright and Japan. 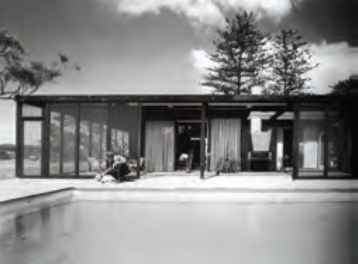 The Case Study House Program was conceived by John Entenza, the Los Angeles-based editor of Arts & Architecture magazine. Entenza envisioned the Case Study effort as a way to offer the public and the building industry models for low-cost housing in the modern idiom, foreseeing the coming building boom as inevitable in the wake of the drastic housing shortages during the depression and war years. He urged architects to design and build homes that would not only explore the advantages of modern residential living but also promote the economical construction concepts of prefabrication and mass production. From 1945 to 1966, thirty-seven projects were proposed and twenty-five were constructed in the Los Angeles area. 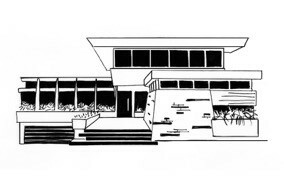 The architects hired to design the Case Study houses, for sites that were mostly in and around Los Angeles but ranged as far as the Bay Area and Arizona, made up a who’s who of California modernism: Charles and Ray Eames, Richard Neutra, Julius Ralph Davidson, Raphael Soriano, Pierre Koenig, A. Quincy Jones and Craig Ellwood, among many others. The houses were generally modular in plan and featured steel and/or timber structures. This approach is reflected in the works of Bryce Mortlock, Russell Jack, Douglas Snelling, Terry Dorrough and Andrew Young. These architects were inspired by Scandinavian architecture particularly the work of Finnish architect Alvar Aalto. Houses of this style are recognised as having bagged and painted brick walls and terracotta roof tiles on steeply sloping roofs that follow the slope of the site with dark stained exposed timber structures and window framing. This approach is reflected in the works of Ken Woolley, Keith Cottier, Michael Dysart and Philip Jackson. Brutalism originated in the mid-1950s in Britain, building on the work of modern architecture pioneer Le Corbusier. The philosophy stresses the unity of form, structure and function. 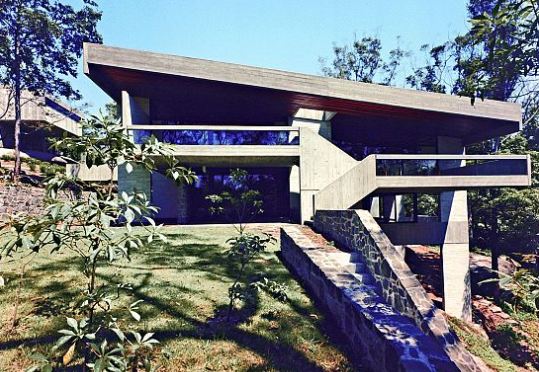 It celebrates the process of construction, often using off-form concrete that reveals timber markings. This approach can be seen in the works of local architects such as Tony Moore, Peter Johnson and Peter Hall. 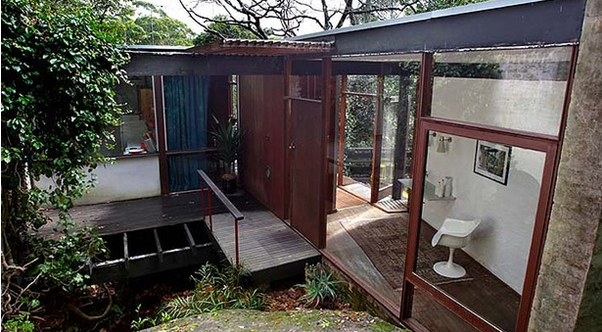 One of the best Brutalist-style houses in Sydney is thought to be the Penelope and Harry Seidler House in Killara.